September 11, 2017 09:35 ET | Source: Metallic Minerals Corp.
Metallic Minerals Corp. (TSX VENTURE:MMG) (OTC PINK:MMNGF) ("Metallic" or the "Company") is pleased to announce that it has entered into an option agreement to acquire a 100% interest in 36.4 square kilometres ("km2") of mining rights (the "Property") along the Australia Creek drainage, a tributary to the Indian River, in the Klondike gold district near Dawson City, Yukon. In parallel with this acquisition, Metallic has entered into a production royalty agreement with an experienced alluvial mining operator with respect to a 2.8 km2 portion of the Property (Lower Australia Creek). Under this agreement, the operators will have exclusive rights to mine the Lower Australia Creek property, in exchange for a 12% royalty on all gold production payable to Metallic. The property is road accessible and is permitted for alluvial gold production. Mining equipment has been mobilized to the site to commence test work in September for the remainder of the northern field season. Australia Creek is part of the historic Klondike gold district that is estimated to have produced over 20 million ounces of gold since its discovery in 1898. 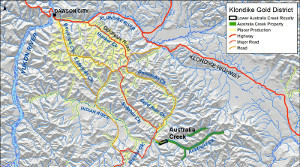 Australia Creek and its benches are now recognized by Yukon Geological Survey as an eastern continuation of the highly-productive Indian River drainage, which is the largest placer gold producing area in the Yukon. Mining on the Indian River began in the late 1970s and has produced about 250,000 ounces or more than 40% of all placer production in the Yukon through 2015. With the expansion of larger-scale, open-pit operations, production on the Indian River has doubled since 2010 and accounted for 46% of the Yukon's total placer gold production in 20151. Despite extensive mining activity nearby, Australia Creek itself was never historically mined due to its importance as a source of water and hydro-electric power for supporting the broad scale, floating dredge operations that were being conducted in the area by Yukon Consolidated Gold Company (YCGC) which operated in the Klondike Region between 1920s and 1960s. The dams on Australia Creek have been removed with only the historic diversion channels now remaining. YCGC did limited exploration churn drilling at the mouth of Australia Creek, but no further exploration up the drainage. The mouth area is being actively mined at present and auger drill holes on Lower Australia Creek have returned values in the gravels similar to other parts of the Indian River, with initial test pits in 2015 to 2017 confirming the presence of alluvial gold. At the beginning of September, Prime Minister Justin Trudeau and Yukon Premier Sandy Silver announced a combined $360 million in federal and territorial funding for the improvement of existing road access in the territory as part of a demonstrated commitment to facilitating resource development. 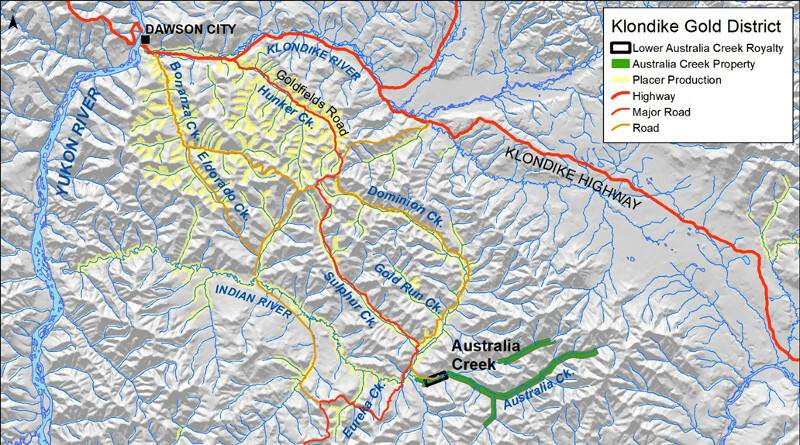 One portion of this initiative is the upgrading of the existing public road through the Klondike gold district that begins near Dawson City and travels along Hunker and Sulphur Creeks before reaching Australia Creek and continuing south to the Dawson Range in the central part of the Yukon Territory. Greg Johnson, CEO and Chairman of Metallic Minerals, noted, "We are very pleased to have acquired the high-potential Australia Creek Property in the prolific Klondike gold district and to have entered into our first production royalty agreement on the lower 2.8 km2 of this package. We also support the commitment by the Federal and Territorial governments to improving infrastructure for resource development in the region, which will benefit development at Australia Creek. Though the core focus for Metallic will remain on exploration in the Keno Silver district, we see an opportunity to build a portfolio of production royalties from our holdings in the Klondike region, starting with this first one on Lower Australia Creek, and to increase the number of production royalties on the remaining large land position with additional experienced alluvial operators over time. Test work is anticipated to be conducted starting in September and continue throughout the remainder of the 2017 season. The alluvial mining operators are expected to make a decision regarding full-scale production, with respect to these Lower Australia Creek claims, in early 2018." Upon regulatory approval of the agreement, a total of $50,000 is to be paid by Metallic to the underlying claim holders upon signing for partial reimbursement of accrued expenditures. In December 2017, a further $25,000 is to be paid to the underlying claim holders for carrying out consulting and supervision activities in 2017 and 250,000 shares are to be issued based on a program of drilling, geophysics and test pitting, provided at least $75,000 has been spent on the ground by Metallic or its operating production royalty parties. In December 2018, another $50,000 is to be paid and 250,000 shares are to be issued based on follow-up exploration and test mining program producing gold and at least $100,000 spent on the ground by Metallic or its operating production royalty parties. In December 2019, a final $50,000 is to be paid and 400,000 shares are to be issued based on continued mining on the Australia Creek property with gold royalty production or a new mining lease agreement with another alluvial mining operator on additional claims. Under the option agreement on the Australia Creek Property the underlying claim holders will receive a 4% royalty on all alluvial gold production from Metallic. Metallic can purchase each 2% of the underlying royalty for $250,000 in cash, gold or Metallic shares at a minimum price of $0.35 per share. One of the co-partners in this option agreement is a related party as a director of Metallic. The option agreement is subject to regulatory approval. Metallic Minerals has been engaged in a two-phase exploration season at its flagship Keno Silver project, which commenced in May with targeted geophysical and geochemical surveys, stratigraphic mapping, and trenching to further refine the identified priority targets. Diamond drilling on the project commenced in August and is focused on testing down-dip and along-strike extensions of previously identified mineralization along the known mineralized trends, including at some of the historic producing mines on the property. Initial samples from drilling and continued surface work on the Keno Silver project have been submitted for assay and results are pending. In addition to work undertaken in the Keno Hill silver district, Metallic also engaged in a program of surface sampling and trenching at its McKay Hill silver-gold project 50 km northwest of Keno Hill. The Company expects to provide updates and results from these programs over the ensuing weeks. Metallic Minerals Corp. is a growth stage exploration company focused on the acquisition and development of high-grade silver and gold in the Yukon within underexplored districts proven to produce top-tier assets. Our objective is to create value through a disciplined, systematic approach to exploration, reducing investment risk and maximizing probability of long-term success. Our core Keno Silver Project is located in the historic Keno Hill silver district of Canada's Yukon Territory, a region which has produced over 200 million ounces of silver and currently hosts one of the world's highest-grade silver resources. The Company's McKay Hill project northeast of Keno Hill is a high-grade historic silver-gold producer. Metallic Minerals is also building a portfolio of gold royalties in the historic Klondike gold district. Metallic Minerals is led by a team with a track record of discovery and exploration success, including large scale development, permitting and project financing. To view the map associated with this press release, please visit the following link: http://www.marketwire.com/library/20170908-Australiacreek.jpg.